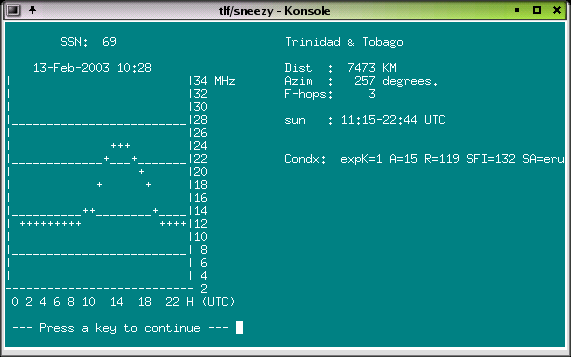 TLF-0.9.9 is a console (ncurses) mode general purpose CW keyer, -logging and -contestprogram for hamradio. It supports the CQWW, the WPX, the ARRL-DX , the ARRL-FD,the PACC and the EU SPRINT contests (single operator)as well as a lot more basic contests, general QSO and DXpedition mode. It interfaces with a morse code generator, a number of radios, and with a DX Cluster. Tlf can project cluster data into the excellent Xplanet program, written by Hari Nair. Contest operation mimics the popular TR-Log program for DOS, the output file is TR- as well as CABRILLO compatible. 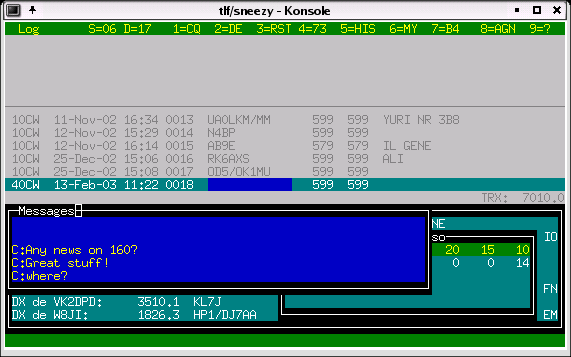 The program was written for console mode on purpose, to make it run also on smaller machines, or remotely via a modem link. TLF is developed under SuSE 9.0, and tested under SuSE 8.0, kernel version 2.4.1. Beta testers welcome !!! There is now also a two-floppy version in development called debianham. That version is maintained by the Debian community, and contains a Linux mini-distribution and a copy of tlf (version 0.8.19).
. The cwdaemon-0.7 is fully supported, featuring direct mode for the keyboard and output to parallel and serial ports and speed and weight control from the keyboard. Two more keyer modules are supported. The cwkeyer from Ivo, 9A3TY with output on either ttyS0 or ttyS1,and the (more flexible) cwkeyer for the parallel port from Eric, PA3FKN with output on LP0. They both work with a cw output device called /dev/cwkeyer,and can be fully controlled by TLF. As the cwdaemon is now more flexible than the other modules, and easier to maintain (it runs in user mode rather than as a kernel module) focus of the development is on the cwdaemon. Tlf works with Hamlib-1.1.4., you find it at Sourceforge.com. 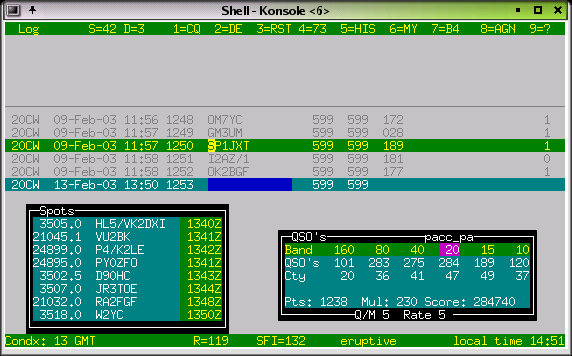 TLF started as a simple keyboard interface to cwkeyer-0.1 from 9A3TY. When the WPX 2001was 2 months away I had to try to write my own program. That turned out to be great fun. The result of this is TLF,which very much represents my idea of what a CW contest program should do. Some have asked what the name stands for. The old hands from the days when CW was still hand-crafted willcertainly know. It means Try Left Foot. On special request TLF will now also log SSB and DIGIMODE qso's. or WWV data if available via packet. Sidetone is adjustable (and optional). TLF interfaces to the keyers through ip networking (cwdaemon), Both for output on the parallel port and the serial port. Interface to the radios has been kept modular, since tlf-0.7.0 the hamlib library is supported, which enables control of various popular rigs. Tlf is now fully networked, with an extremely simple setup procedure... You have to see it to believe it..! Download cwdemon-0.7.tar.gz and untar it. The program is installed in /usr/sbin, and can be started (as root) with cwdaemon (or cwdaemon -n). The default output port is /dev/lp0. Be sure to unload the lp module first (rmmod lp).See the provided README for more details. The manual page will tell you some more about startup options, you could also type cwdaemon -h.
Install the netcat package and type: 'nc -u localhost 6789'. echo "Press (CTRL-C) to interrupt..."
- As root, do ./configure, make, and make install. - Add /usr/local/lib to /etc/ld.so.conf and run ldconfig (as root). Get the latest distribution of tlf from the download site (http://savannah.nongnu.org/download/tlf). Tlf now supports GNU autoconf and automake, which automates the installation process, and makes sure you haveall the goodies on your machine which tlf needs..
You have to be root to install tlf. It is good practise to use separate directories for the different contests. start tlf with tlf. Normally startup messages are suppressed to enable a quick restart of the program. If you start tlf for the first time in a directory you will get messages from the services which are started. If you want that later on (for debugging purposes) start tlf with tlf -v.
If you want to know which version you are running start with tlf -V.
The general commands to configure tlf are in logcfg.dat; the contest specific parameters are in ./rules/cqww. With tlf-0.9.9 it is now possible to start tlf with different logcfg.dat files for each operator. If you sgtart tlf e.g. With tlf -fPA0R you get the logcfg.dat file for PA0R. The cty.dat file included in the distribution of tlf-0.9.9 is the one from October 2003. This is the input FIFO for the DX cluster monitor. You only need it when you use a dx cluster, or any other information you want the program to display, and if you cannot use ttyS0 or ttyS1 (e.g. you have only 1 serial port, which is used for rig ctrl). There are several ways to get the cluster data into it. You can use the "call" ax25 tool. .
TLF will pick it up from there (it will look in the working directory for clfile!!). TLF now also has its own comfortable telnet client and tnc terminal ! !You have to set the proper parameters for this in the logcfg.dat file. Note:When your tlf node wants to receive packet date via the LAN, from another tlf node, the FIFO must also be active.... For this purpose you must set FIFO_INTERFACE in the logcfg.dat file! This is the DXCC database. It resides in /usr/local/share/tlf. This is the contest calls database. It resides in /usr/local/share/tlf. The parameter file. It remembers some parameters for the next session. TLF will generate one for you. It is not necessary to touch this, as all parameters are included in the file logcfg.dat, which can be edited within tlf. As more functions become available in future, new rules templates will become available. Lines starting with '#' are ignored. If there is no ./rules/contestname file in the working directory tlf will try to read the one from /usr/local/share/tlf/rules. The log file. You name it! This file will be generated by the ":adif" command after the contest. This file format can be used to post the log to LOTW or import in other loggers. CT compatibility has been added to tlf in order to make it easier for those who have been workingwith CT a lot as guest operators during M/S or M/M operations. The CT compatible commands are active all the time, they are just aliases for existing tlf commands. "+" will send F3 (QRZ message, e.g. 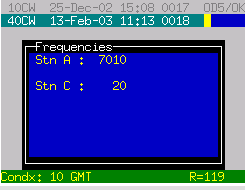 TU 'yourcall') and log the qso, instead of toggling between CQ mode and S&P mode (there is no S&P mode in CT). The log file of tlf is TR compatible, also in CT compatibility mode. All activity takes place in the call input field (and the exchange input field..). Call edit now uses Insert mode as default. In edit mode, ctrl-A will jump to the beginning of the call, ctrl-E to the end. In edit mode, Backspace removes the character before the cursor, Delete deletes the charactor under the cursor. If after a Delete or an Insert you leave edit mode with ESCAPE or ENTER, auto_complete is not switched off. 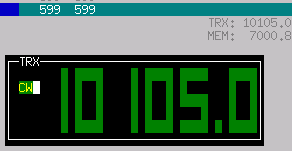 The bottom status line will show country and qrb info, as well as the local time of the station.. When you press Ctrl-p you will get a screen with the muf curve based on the number of sunspots,the distance, bearing , sunset, sundown etc. Any key will get you back to where you came from. You can go to the exchange field with SPACE or TAB or ENTER. For the arrl_ss contest the exchange input is intelligent, incl. call update in the exchange field.E.g. in SS you can enter 23A 98OH and tlf knows what you mean. ENTER will log the qso in SSB mode, and also if you are in CW and qso (non-contest) mode. In case you want to log a cw qso during a contest without cw output, you can use "\" (backslash). Tlf will automatically generate an qso b4 message in case you try to work a dupe. This message is taken from message F7. If you want to work the dupes anyway set NOB4 in logcfg.dat !! Using the "-" key will delete the last qso from the log (after asking your permission of course). You can edit the 5 previous qso's with "Up-arrow". 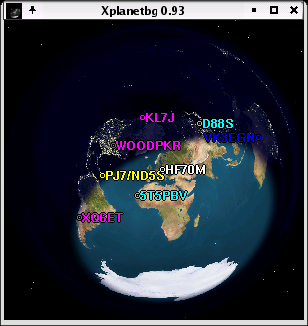 This qso editor is using overwrite mode. Use the cursor keys tonavigate, and leave edit mode with enter, tab or escape. You can use Insert and Delete. If you use "up-arrow" in the first line you go into LOG VIEW mode. During edit mode LAN messages are kept in a buffer. You can edit anywhere in the log with the :edit command. Edited qso's are NOT sent to other nodes in the network. But you can sync the logs with another node with the :SYNC command. You can change RST sent when a Call is in the Call Input Field. Page_down will lower the S value and Page_up will increase it. RST received can be changed by going into the exchange field and using Page_down and Page_up accordingly. The commands are :MODe, :CWMode, :SSBmode and :DIGimode . When you are in the call input field, use the left_arrow and right_arrow keys to change the band, also with the Trlog commands Alt-v and Alt-b. You can switch off the arow keys by entering NO_BANDSWITCH_ARROWKEYS in the logcfg.dat file. When contest mode is on, only the contest bands can be reached (160-80-40-20-15-10). Show list of zones yet to be worked: ":zones"
Show list of countries left over: ":cty"
Switch to keyboard: "," or "ctrl-k"
Change the weight with Alt-w, Values from -5 to +5, ENTER. Start the auto_cq with F12. Or if contest mode is on, and input field is empty, with ENTER. Switch to keyboard: "," or "ctrl-k" The above commands also work when the keyboard is on. Change the sidetone frequency with ":tone". A value of 0 will switch sidetone off. The rig control works with Hamlib-1.1.4. You can use e.g. /dev/ttyS0, /dev/ttyUSB1, etc... anything that looks like a tty. RPC rig daemon users should have RIGMODEL=1901 and RIG­PORT=localhost. In this case RIGSPEED is ignored. See your trx frequency on the right hand side of the screen just below the log line. 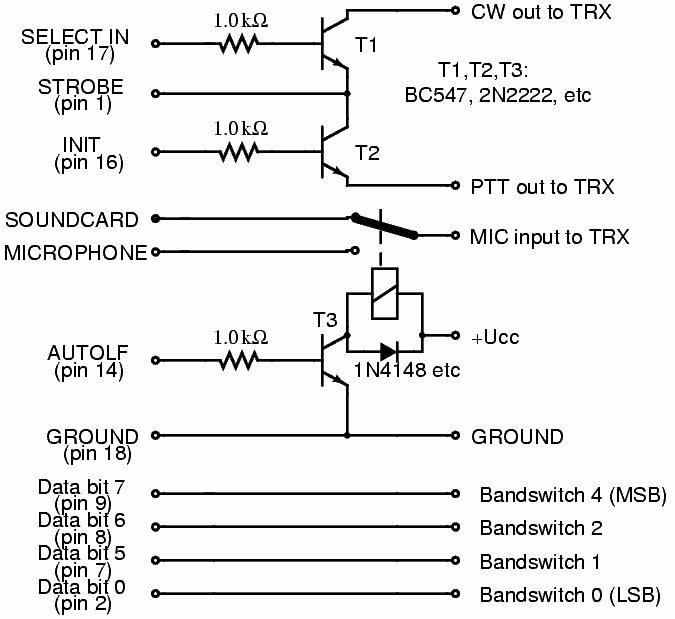 Tlf will follow the bandswitch of the trx. 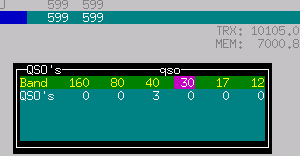 Fast qsy by just entering the new qrg into the empty call input field in kHz (e.g. 3505). Remember your run frequency by putting it into the memory with "#". The memory display will pop up and show the frequency you can return to by again entering "#". Add a spot to the list by entering a Call into the call field and pressing Ctrl-A. Thisworks with band map as well as spot list. If you set the RIT parameter (:RIT), the RIT will be reset after a qso is logged.This only works if your radio supports the set_rit function!!! A Radio Control Interface is available for a growing number of rigs. Look at the log with ":view". It starts a new shell with LESS. Set parameter TIME_OFFSET in logcfg.dat when your computer clock does not run on UTC. The parameter can have anyvalue between -23 and 23. This will enable tlf to show the DX time of a station you are working. Tlf is picky with respect to the exact format of the file; make sure the stuff is in the right columns! When there is a TIME_MASTER on the network, the tlf clock will be synchronized with the master. To designate a station as a time master, just set TIME_MASTER in logcfg.dat. The score window is adapted to the contest you are in. So if the contest parameter is set to cqww, you geta special score window for it, showing qso's per band, countries worked per band, zones worked per band and total score. It also gives an indication of the qso's per multiplier, and the qso rate based on the last 10 qso's. When you restart the program the score is recalculated from the log file. When a qso is deleted from the logfile the score is not adjusted, neither is the list of counties worked updated. You can correct this by using the :REScore command. With this operation the points are taken from the log, and the mults are recalculated! Through deletion of qso's and node down times the logs on separate nodes may differ after running for considerable time. This is normal, it happens also with CT and Trlog. Tlf can resync the log of a node on the fly by setting the SYNCFILE=<user:password@host/dir/logfile> parameter in logcfg.dat. By issueing the :SYNC command the local log is merged with the log on the other node. It is even possible to start a node mid-contest without a log, :SYNC will get the log from the master node. 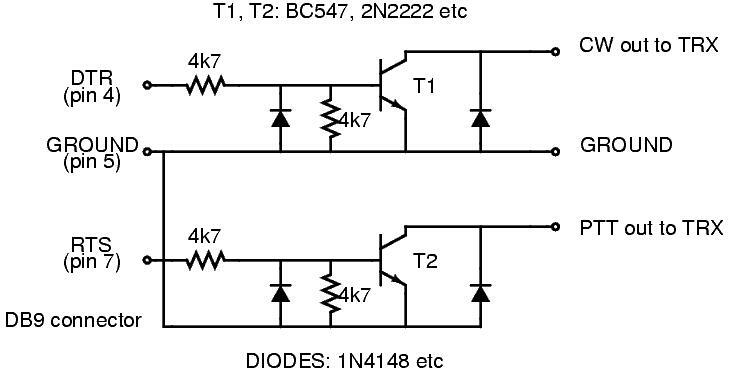 The format of the display is dependent on the type of multiplier(s). I may be that for a certain combination of points and mults a display is not yet available, send your requirements to the mailing list (tlf-devel@nongnu.org). Well in advance of the contest you need it for !! F2 = free (normally "@ DE %"
F5 = free (normally "@"
F6 = free (normally "%"
F7 = free (normally "B4"
F8 = free e.g. "AGN"
F9 = free e.g. "?" F10 = free e.g. "QRZ?" F11 = free e.g. "UR CL?" F12 = auto_cq message, e.g. "TEST PA0RCT"
S&P TU msg = e.g. "TU [14"
Run TU msg = e.g. "TU %"
The easiest way to handle the messages is to edit them in the rules file for the relevant contest. You can keep separate rules files for different contests and operating situations. You can list the messages with ":list" and change them with ":message". If the station is a dupe, the color will be red and the terminal will beep. In case of other multipliers, on what bands they were worked. In the arrl sweepstakes contest e.g. the exchange is SERIAL-PRECEDENCE-CHECK-SECTION. Tlf enables you to input these items in almost any order, like 12A 87ORG or ORG 12 87 A.If you set CALLUPDATE in logcfg.dat, the call in the call input field will be updated also. (needs blanks on bothsides, works for US/CANADA only...). The lowest line in the check window shows if tlf has recognized the right ingredients. If no section is present in the exchange, tlf will ask for it before logging the qso. This needs some experimenting before the contest to get acquainted with this feature. The check partial calls function uses a database derived from the master.dta file containingsome 25.000 known contest calls. When the USEPARTIALS parameter is on, tlf will complete the call as soon as it is unique in the database. This can of course lead to strange effects, but in my experience there are far more hits than misses.Sometimes you must edit the call because it has locked on a unique call.... Try it, and switch it off when you don't like it. Some people find that 9 calls is not enough.... MANY_CALLS will give you many calls. The propagation screen is invoked with ctrl-p. The calculation actually uses the SSN value which is derived from SFI. If you are connected to a cluster, the WWV values will automatically be stored, and the last value used.Clfile is periodically checked for this, and the value stored in wwvfile. Starting with version 0.4.4 it is now possible to include the value of R or SFI in the logcfg.dat file. All timing is related to UTC. You get to the packet terminal with :pac. Goto the working directory and start a telnet session in a new terminal. For filtering, bandmap etc to work, the lines have to start with: "DX de", Escape characters at the start of the linehave to be filtered out (e.g. by using "|cut -c 7-97"
As the FIFO_INTERFACE overrules the other ways of connecting, be sure to switch it off when using the tty or the telenet client!! Ctrl-G - grab the spot: type a partial call from the spot or map window into the call field first. Outside the bandmap you can Grab a spot by entering a few characters into the call input fieldand typing ctrl-g. The full call will appear in the input field, and the trx will go to the spot frequency (only iftrxcontrol is working). Spots younger than 10 minutes are marked!! 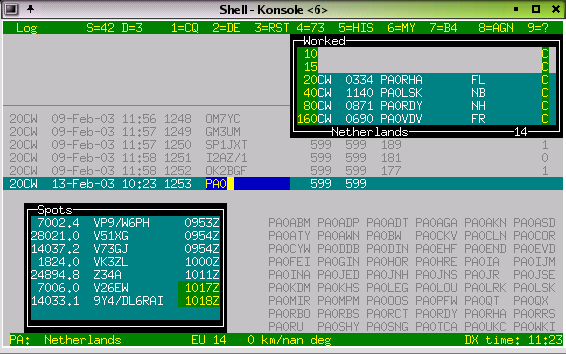 The bandmap sorts the frequencies and flags the ones you don.t need (yellow). so you will see only those countries you still have to work!! (see the xplanet documentation for an explanation). 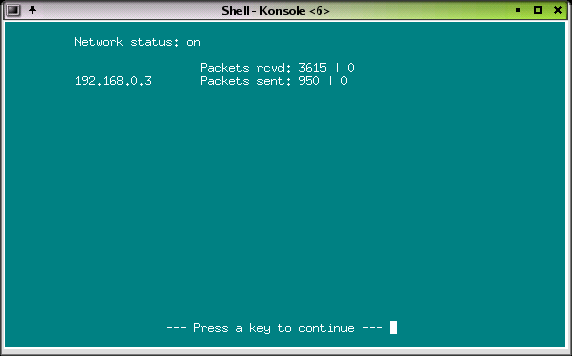 The tlf network interface uses the udp/ip protocol. It can handle as many nodes as the network bandwidth supports,but is limited to 8 nodes at present. (Address space is 64, so recompilation with MAXNODES=64 will handle 64 nodes). The udp protocol is used for minimum protocol overhead. Tests with several tlf nodes have shown that using the tcp protocol does not cure a network problem, it just adds protocol overhead. The tlf protocol uses short messages,which will not exceed the limit where fragmentation sets in. (udp buffer length is 256 bytes). A :SYNC command will synchronize the log on your machine with the log on another specified node if at all necessary (e.g. If a node has been down for some time, or started up during the contest). Each node has 1 receiver on udp port 6788, and sends the data it generates to the destination nodes.The list of destination nodes is defined in logcfg.dat of every node. THISNODE is a character(A to H) and message type is also a character (1 to 9). Every tlf node has a copy of the complete log database. This has several advantages. Second, it allows using the full power of the log search function (exchange recall and multiplier search). Here you see that station A is on 7010 kHz and Station C (no trx control) is on 20 meters. Used when a serial number is used for the exchange (SERIAL_EXCHANGE is set in logcfg.dat), e.g. in the wpx contest.As soon as a serial number is sent, it is blocked on the other nodes.... This bridges the time between sendingthe exchange and actually logging the qso, mostly preventing that serial numbers are given out twice!! When TIME_MASTER is set in logcfg.dat the station broadcasts the actual utc time to the other nodes. When you do this, the other tlf nodes will use this time. The time receive function has a smoothing filter,so one wrong number will not kick the node out of sync. To use networking with tlf is not difficult. For tlf, the word is: "if you can ping it, it will communicate". Second step: Provide a short form unique address for the node, so tlf can seewhich node generated the data. For brevity this address is a character from A...H (for an address spaceof 8 nodes). If tlf hears it's own node ID it will ask for another one!! Third: Edit logcfg.dat for each node. The only data tlf needs are the short form address of its node,and the ip addresses (the addresses you use for the ping) of the nodes it wants to communicate with. During the communication setup phase it is possible to write a logfile (debuglog) of all messages the node receives to disk. To receive packet information from the network, the FIFO input should be activated. With :info you get a screen showing the node addresses, packets received, packets sent, and numberof send errors per node. A send error occurs when a node cannot be reached, e.g. if tlf is not yet running on it. The CW simulator is switched on with ":sim". After your CQ with F1 the run begins. If it stops, call cq again. The simulator is meant to work in TRlog mode. It uses the PC speaker for output. This means you can not switch off the speaker with :TONE in simulator mode! the keyer is started with Ctrl-K or with "," (comma). The comma will only work when the callinput field is empty (and if trxmode is CW of course. Stop the sending with ESCAPE. - Reprogram the key saying SRI QSO B4 to contain the local WX. Most commands start with a ":", and you need to type only the first 3 characters. Keyboard on. This works only when the call input field is empty. use ctrl-k if it isn't. Send talk message to other tlf nodes"
don't forget to change this one !! CQWW_M2 is set togetherwith CONTEST=cqww if you are working in the M2 category. This sets the station info into the cabrillo file (stn1 or stn 0). Use CONTEST=qso for general log use. time offset to utc in hours if your system clock does not run on utc. Don't send QSO B4 message in F7, work the dupe! Points per qso for scoring. 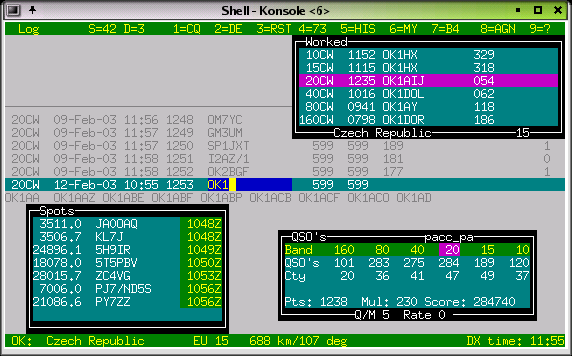 In this example, a qso with SP will get 10 points, a qso with your own country 1 point, another country in your own continent 2 points, and any dx qso 3 points. If USE_COUNTRYLIST_ONLY is set, the countries in the list get COUNTRY_LIST_POINTS, and all others 0. The first 3 parameters override all others, i.e. ONE_POINT gives 1 point to every qso. This will take care of the "license year" multipliers, which count as a multiplier on each band, and give you one point per qso. The score window will show the proper data, and the contest will be rescoredevery time you restart tlf. This would give 11 points per qso with PA, ON or LX, and no points for working XW8AA. The multiplier could be a province or section abbreviation, your age, year of licence or the name of your cat. Include a file usa_canada_states in the working directory. This is a matter of time and priorities.